This blog is about my wife and I sailing our 13m sailing catamaran around Australia during 2012 2013 and 2014. 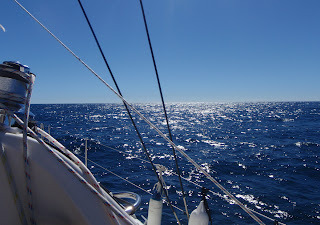 We will sail from Brisbane at the end of April 2012 and slowly head north anticipating that we will arrive in Darwin for the cyclone season and head west when safe to do so and complete the circumnavigation. 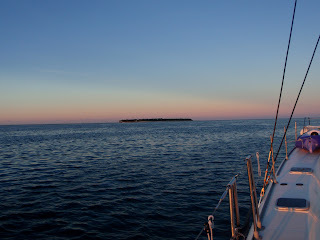 After a couple of days at Bundaberg we set sail for Lady Musgrave Island as the weather predicted was SE 15/20 knots for Saturday and thereafter no wind for four days which makes for ideal conditions on the reefs. Our last night was spent with host Wayne (of Yacht Domain Brokerage), he hosted the Shag Islet Cruising Yacht Club monthly get together which is held outside his office the first Friday of every month. He had invited everyone that was at the marina and we had a good night although we did not stay for its duration as we planned to sail early next morning. Saturday I was up at 0415 hours put the kettle on being the most important task before rolling up the covers and getting all else ready before leaving. After having a few sips of the tea we singled up the lines disconnected the power, turned on the navigation lights and instruments started the engines and slipped away from the dock. 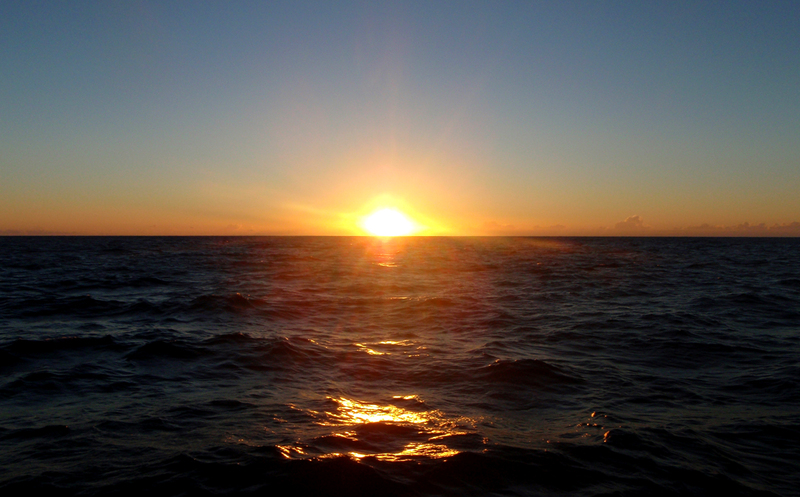 The time was 0500 hours and it was still dark, we headed out the channel of the Burnett River with another yacht ahead of us which we caught up with as it was going rather slow. 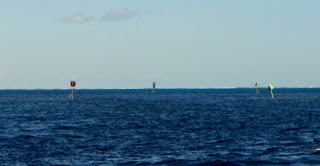 We turned out of the channel as soon as the water was deep enough to allow us to do so which is about two navigation markers short of the end of the channel as soon as we were in clear water away from any shallows we set our course for 345⁰ magnetic to bring us on the western side of Lady Musgrave Island. About two miles out we got under sail with the wind close behind we went under genoa alone and was getting along at 5.5 to 6 knots a nice steady pace this should get us there at the turn of the tide for easier access to the cay. 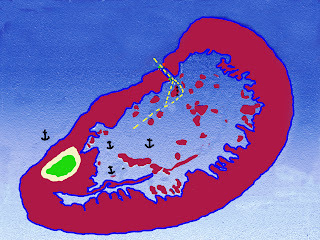 We sailed just over half way before the wind backed off and our speed dropped below 2 knots so it was time to hit one of the iron sails and we motor sailed up until about 5 NMS from Lady Musgrave where the wind disappeared and the sail just flapped so we furled it and used the engine alone. As we neared Lady Musgrave I started the other engine to warm it up before entering the access to the cay of Lady Musgrave. 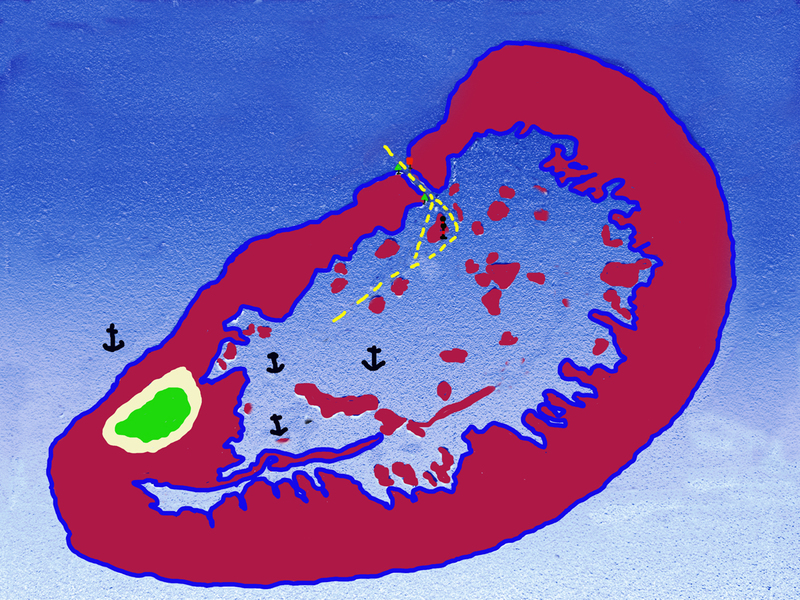 The directions for entry is that you line the boat up in line with the centre of the channel marked with a port and starboard marker and steer 130⁰ magnetic, having someone on the bow is advisable to give guidance once you enter to watch out for bommies, (coral mounds). The water is plenty deep enough we arrived just after low tide and shallowest we had was 6.4 metres and we anchored in over 7 metres of water. Our friend Rick and Michelle on 'Neriki' arrived just ahead of us so we had a bit of a reunion once anchored that actually turned into staying for sundowners followed by dinner. We had a good night catching up. Their boat was hit by lightening some months back and it took them two months to get the boat back to operational condition with waiting for insurance companies and getting all the electronics replaced. During the very early hours of the morning I woke to the boat rocking and once alert I could hear the wind howling in the rigging. I got up to check all is well the time was 0230 hours. I switched on the instruments and the wind is 20 plus knots. This was not in the predictions the wind was supposed to die for a few days. I checked the anchor and the anchor watch GPS and all was well so I went back to bed although not having a good night's sleep as I kept waking to check all is well. When daylight broke the wind was still there and being out at Lady Musgrave we cannot get internet to see what is happening so we had to wait for VMR Bundaberg to transmit the weather which is around 0800 hours. One fellow called out on the radio asking if anyone had a weather update, an answer came back from another boat, "yes it's bloody rough". No help there. When we got the weather report it was entirely different to what I got from the Met on the internet the morning we left this wind was to stay all day and taper off in the evening and lighter winds thereafter for three days but still higher than first predicted. Lady Musgrave Island is an atoll where many years ago it is believed that someone blew a hole in the reef to allow boats to enter to collect guano and since for boats to anchor to enjoy the lagoon some of the naughty things we did in the earlier days where you would be hung out to dry if you even had a thought of doing something like that today. 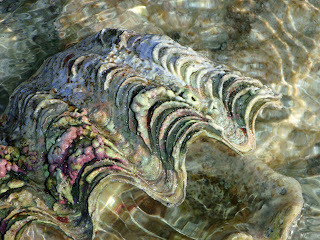 It is one of many reef formations in the Capricorn and Bunker Group. 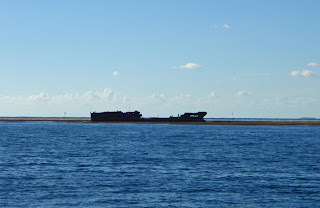 It is situated 56 NMS north of Bundaberg and 35 NMS east of Pancake Creek. We went ashore yesterday for a walk and look around it is pleasing that they now have port and stbd floating markers to guide you into the beach, three years ago there was nothing to guide you and it was easy to hit some of the live coral as people did not know where to approach the island. We went ashore at low tide as you can see from the picture. The tide was very low due to the full moon . I believe that last night the moon was at its closest to earth as it has been in more than 800 years, a little bit before my time. As we started to walk on the beach and go around the island we were swooped on by nearby birds, Little Terns, they were nesting so we kept our distance. They attacked similar to that what Magpies do in nesting season making loud squawks and diving for the head. They were just on one small section of the island. As we went further there were lots of Black Noddys in the trees and flying around. One often see them out to see fishing. 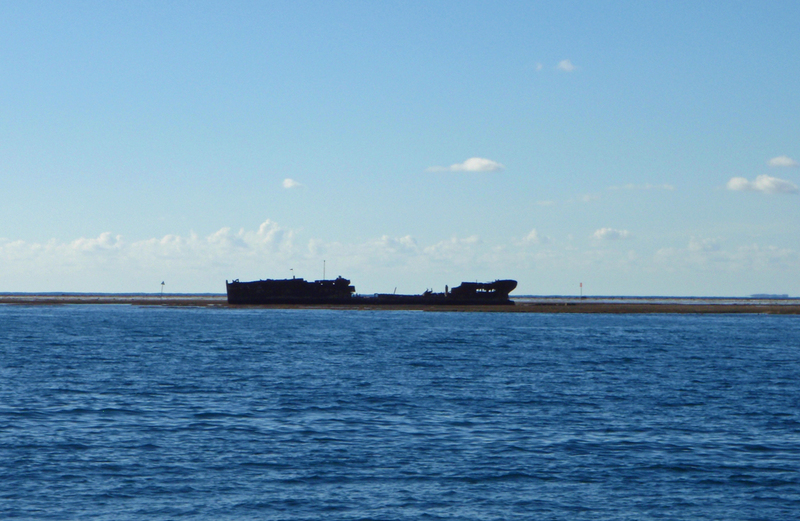 You start to see these north of Fraser Island. This island like many has suffered beach erosion from the stormy seas of the last two years there was a lot more beach three years ago when we were here last. Last time we were here there were a lot of campers but that could have been due to it being school holidays at that time, there aren't any campers here at the moment. It is a national park so permits are required to camp on the island, it is also a marine park so one must check the marine parks charts before dropping a fishing line in the water. These charts are free from many outlets, waterside information places or chandlers there are many of them as they cover all of the Queensland coast. I have noticed whilst here that some people are dropping a line in where they should not probably oblivious to the laws as they may not have these charts. I must say that most islands and water front that have such restrictions usually have a board near the area where people come ashore identifying the restrictions but there is not one here. Last night we were again invited over on 'Neriki' for drinks and dinner along with new friends Canadians John and Cheryl on ' Sea Mist' Nancy had prepared main course which was a Mediterranean Hot Pot that she cooked in the shuttle chef and Michelle provided desert of apple crumble and custard and cream and everyone brought pre dinner nibbles, Cheryl had cooked some small pies with mustard sauce which were very nice. We had a fun night that went rather late but we all enjoyed it. Tonight it will be drinks on 'Sea Mist', it's a rough life. Last night was a good night aboard 'Sea Mist' it was another extended sundowners all the girls had made different dishes for sundowners that there was so much it ended up being dinner. We returned to 'Alana Rose' about 2200 hours. 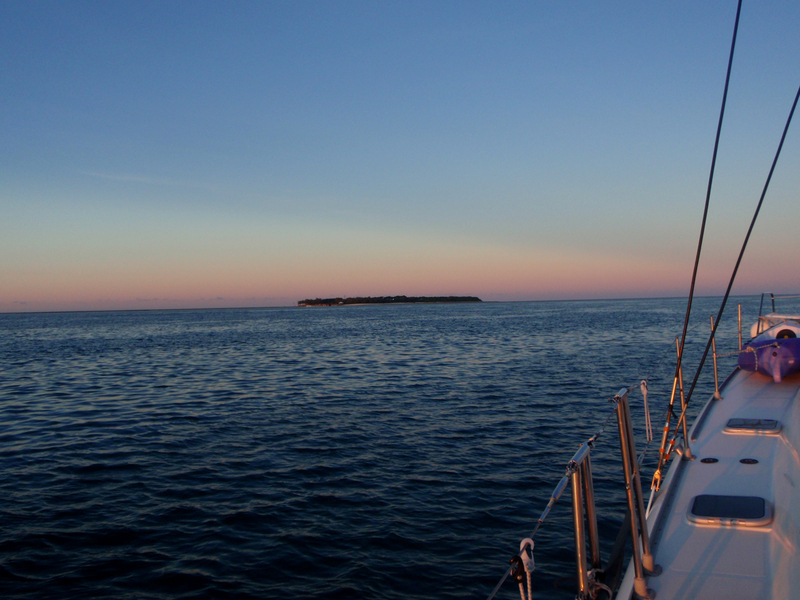 Our plan today is to sail from Lady Musgrave to have a look at Fitzroy Reef and if we are not keen on staying there to go onto Wistari Reef and anchor there for the night. Rick and Michelle on 'Neriki' are leaving with us. We waited for the tide to flow in a little so that it started to come over the reef itself and not just rushing against us through the inlet so around 0700 hours I started getting things ready I noticed 'Neriki' was doing the same. We weighed anchor and started heading out, 'Neriki' had its engines running so I assumed they would do the same. We followed our entry track out but Nancy still stayed on the bow to watch for bommies. Once out of the access passage we turned into the wind and hoisted the mainsail then turned on course and unfurled the genoa and shut the engines down. It is good to just sail and I hoped the wind would last all day. As we settled I looked back and 'Neriki' had not moved, I said to Nancy, "I was sure they were ready to leave". The next thing Michelle called on the radio and said the clutch on the anchor winch was slipping. I suggested the fix maybe to tighten the nut on the outside of the gypsy, Michelle said they had done that. Next she said the problem is the anchor has fouled in a coral bommies so they have to go for a dive. They told us not to come back they will catch up later. We sailed nearly all the way to Fitzroy Reef but had to start an engine and motor sail just before we got there. 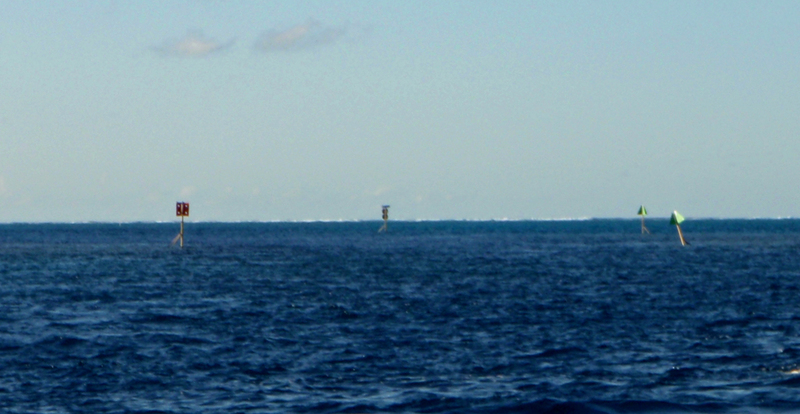 Although there was little wind the seas were messy, there was small choppy wind waves from the SE and a swell from the east this made it difficult to see anything when we neared Fitzroy Reef so I said to Nancy it may be better to go on to Wistari Reef. They say Fitzroy Reef is very pretty the reef is covered with water and there is an access to go inside the reef and anchor for a few boats but you have to make sure that your anchor is set in good holding because if you dragged here there is little room for error and you could end up on the reef damaging your boat. We motor-sailed to Wistari Reef I set the course to go between Wistari Reef and Heron Island, this passage is quite wide and in the centre it is 30 metres deep at low tide. 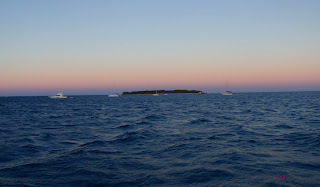 After going through the passage we turned to the noted anchorage at the NE tip of Wistari Reef. Again Nancy went to the bow to look for any bommies and for a clear place to anchor. Visibility over the side was not that good. We anchored in a depth of 7.5 metres and added 3 metres for high tide then from that calculation multiplied it 5 times and put out that much anchor chain. The anchor set well as the tide was pushing us back at a speed of 0.8 knots and we suddenly pulled to a stop when the anchor grabbed, once all the allocated chain was out we went back on it again to make sure the anchor had hold. After we settled I had a look around and did the normal thing of setting the anchor alarm I then went out on deck and had a look around whilst it was still light. I grabbed the anchor chain and it felt solid. (You know where I going don't you?). I had a look over the side and it appeared a little dark at the bottom so my thoughts were it was a coral base anchorage. After dinner I said to Nancy I am having an early night I was tired and I still have the ruminants of the flu, I was also thinking that if we do have trouble with the anchor it may be a long night. (HMCS (Her Majesty's Colonial Ship) Protector was a large flat iron gunboat commissioned and purchased by the South Australia government in 1884, for the purpose of defending the local coastline against possible attacks in the aftermath of the Russian scare of 1870s. She arrived in Adelaide in September 1884 and subsequently served in the Boxer Rebellion, World War I and World War II. I went to bed about 2000 hours and Nancy stayed up reading we had not said too much to each other about doubts about the anchorage but we both had thoughts about it. I woke around 2245 hours the movement of the boat was rocking with the change of tide, at the same time Nancy who was still up called to tell me the anchor alarm was sounding. I got dressed and went up on deck Nancy turned the instruments on and I checked our movement on the chart plotter, we did appear to be dragging but no urgent concern as it was taking us away from the reef into deeper water. This gave me time to check a few things out before deciding what to do. I had a feel of the anchor bridle and I could feel every time a wave rocked us there was a drag of the anchor chain. I said to Nancy that I would not be happy to try and find a good anchorage here in the dark when we sure did not find one in daylight. I said that I think we will sail to Great Keppel Island now I had a couple of hours sleep. We weighed anchor and once underway I unfurled the genoa but we had to use one engine as the wind was not enough. Nancy made a hot cup of tea before she went for a sleep. It was a great night a near full moon that lit the surroundings, it was not a cold night, well not until the first light started to show then I had to grab a few extra clothes. Nancy woke around daybreak just after 0500 hours and I was ready for a sleep, the last hour I was nodding off and had to walk around the cockpit to keep awake. It was a little busy with other ships some cargo and some fishing boats. The last one was as Nancy got up I had to change course to avoid it, although it was supposed to give way to me I don't like to force that issued with a container ship with many more tons than we and you never know if they are paying any attention to what is outside. They would not even feel the bump if they hit us. I had about an hour sleep then woke and came up on deck, again we had these messy seas we were only a couple of hours from Great Keppel Island. Once we were anchored I had another rest. I think I have freshened up the flu again. These are my scribbles and sometimes not proof read as I do not always have the time. I hope you enjoy these. Below are links the first is a locator where you can find out where we are, we can only update where we have internet service. The second is my previous blogsite that you may find interesting and the others are sites of interest. time of our visit in accordance with our instruments on board and I offer these as information in good faith to those that follow our journey. However, it should be noted that seabeds do change from time to time in regard to sandbars and waterways. Therefore any Captain that use this information should treat them as a guide only as instruments may differ and it is the responsibility of any Captain for the safety of ones vessel . I retired April 2007, we flew to St Lucia in the Caribbean to purchase our sailing catamaran 'Alana Rose'. My main working life was last 20 yrs NSW Rural Fire Service, 14 yrs NT Electricity Commission and 9 years Royal Australian Navy with a couple of jobs in between. All writings and photos are fully copywrited to John W Jenks AFSM - jwj © 2012. Awesome Inc. theme. Powered by Blogger.